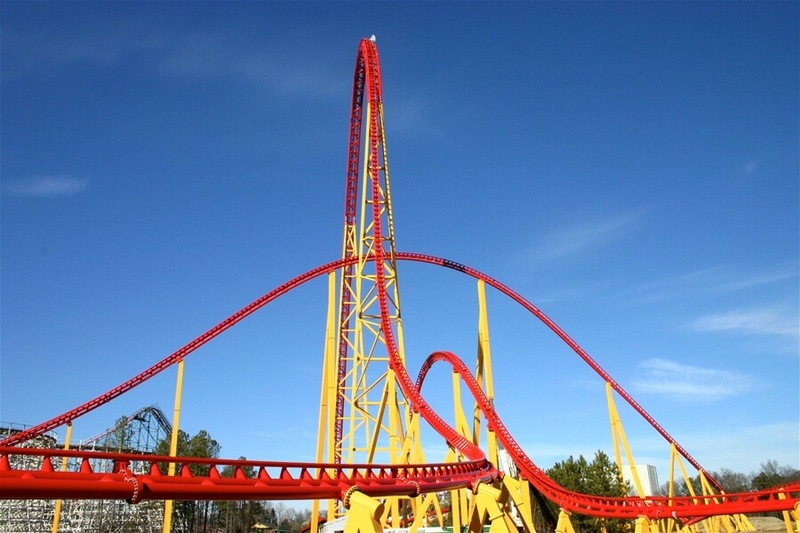 The Intimidator 305 is located at the Kings Dominion theme park in Doswell, Virginia. Hence its name, the coaster reaches a height of 305 feet at its first drop. The coaster reaches speeds of up to 90 miles per hour. The coaster was actually named after the great NASCAR driver, Dale Earnhardt. In 2010, the same year the roller coaster was opened, it received an award for “Best New Roller Coaster in 2010” by a magazine called Amusement Today. When the ride was first opened, riders reported blacking or greying out after the first drop which was caused by the G-forces from the first drop. Shortly after the issue was reported, the theme park decided to install trim brakes temporarily until they could come up with a permanent solution. The next off season after the brakes were installed, the park replaced three sections of the track to widen the radius of a turn after the first drop which took care of the issue and allowed the brakes to be removed. The ride contains six bunny hop hills and three high speed turns. The coaster is a mix of two other coasters, Millennium Force and Maverick, which are at Cedar Point. Going around the turns at high speeds, the coaster picks up about six Gs! One roller coaster that definitely needs trim brakes is goliath at sfmm. I don’t remember Goliath’s drop being that bad. I suppose you could be right about that though.